Uropathogenic Escherichia coli (E. coli, UPEC) is the causative agent in 70 - 95% of community acquired UTI representing a continuous danger for the host. In immunocompromised hosts, UTIs are primarily caused by Klebsiellae and Staphylococcus. UPEC has a lot of virulence factors, in particular: virulence genes encoding a siderophore system to sequester iron (an essential bacterial nutrient) as well as haemolysin, which is able to lyse red blood cells and lymphocytes; adhesive structure enabling bacterial adhesion to epithelial cell to prevent wash-out of bacteria, like fimbrial and non-fimbrial adhesins: S/F1C, Pap (P), and type-1 fimbriae, M haemagglutinin, and non-fimbrial adhesins 1,6. 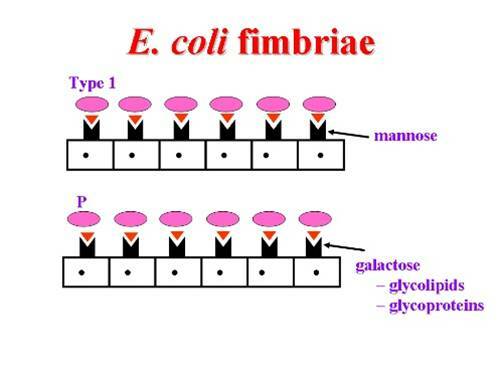 Type-1 fimbriae (essential for invasion of UPEC) are able to bind several kind of receptors (CD11, CD18, CD48, CD44, uroplakins, or some extracellular matrix proteins). 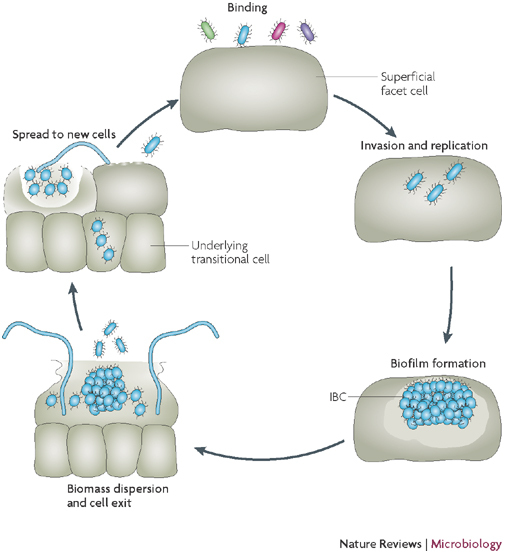 Once bound UPEC is able to invade the superficial layer of the urothelial mucosa where they rapidly replicate to form a biofilm-like intracellular bacterial community (IBC). In the IBC, bacteria find safe haven, are resistant to antibiotics and subvert clearance by host innate immune responses . UPEC can persist for months in a quiescent bladder reservoir following acute infection and challenge current antimicrobial therapies. Bacteria can be awakened from their state of quiescence and develop a new infection. The knowledge of the processes that accompany IBC formation and biofilm dispersal, as well as the factors that drive bacteria into the reservoir, may aid the design of preventive or therapeutic strategies for recurrent infections1.